Javier Bolden was found guilty of first-degree murder in the shootings of Ming Qu and Ying Wu. 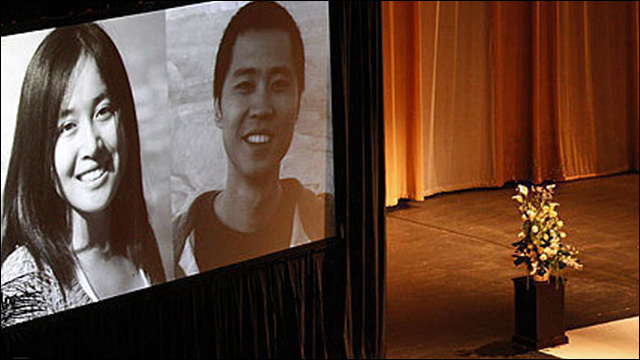 A follow up on this tragic case... On Monday in Los Angeles Superior Court, the 22-year-old man convicted of killing two USC students from China was sentenced to life in prison without the possibility of parole. Last month, a jury found Javier Bolden guilty on two counts of first-degree murder for his role in the April 11, 2012 shooting of Ming Qu and Ying Wu, graduate engineering students who were shot during botched robbery while sitting in a double-parked car near the University of Southern California campus. Throughout the sentencing, Bolden showed no emotion. He was reprimanded by the judge for his lack of remorse and for smiling as Qu's father poured out his grief and anger. "You should be hanging your head in shame," said Los Angeles Superior Court Judge Stephen Marcus. "You have nothing to smile about." Marcus called it "truly one of the saddest cases that I've had to preside over," as he sentenced Bolden to two consecutive life sentences. A second man, Bryan Barnes -- described by the prosecution as a friend of Bolden -- pleaded guilty in February to two counts of first-degree murder. He was sentenced to life in prison without the possibility of parole. More here: USC Student Slayings: "Vile Monsters" Took Their Lives.